The George W. Bush Institute is an action-oriented, nonpartisan policy organization with the mission of developing leaders, advancing policy, and taking action to solve today’s most pressing challenges. Today is World AIDS Day, an opportunity for people worldwide to unite in the fight against AIDS, show support for people living with the disease, and remember those who have died. Despite having come to the forefront of global health in the 1980s, AIDS continues to take the lives of people around the world. In 2013, 1.5 million people died from AIDS-related causes worldwide. In 2013, 24.7 million people were living with the human immunodeficiency virus (HIV), the virus that causes AIDS, in sub-Saharan Africa; 58 percent of those were women, according to the UNAIDS Fact Sheet. This year, UNAIDS's World AIDS Day campaign focuses on closing the gap -- the gap in access to education, testing, treatment, funding, and much more. Another gap that persists today is the knowledge gap regarding the link between HIV and certain cancers. Many of the major infectious and non-communicable diseases act independently, but HIV infection is one of the few diseases that are inextricably linked to a number of cancers. Women infected with HIV are four to five times more likely to develop cervical cancer than their HIV-negative peers. The reason? Infection with HIV weakens the immune system and reduces the body's ability to fight infection by the human papillomavirus (HPV), a major precursor of cervical cancer. Anti-retroviral drugs (ARVs) can prevent HIV infection from progressing to AIDS, but there is no definitive proof they can stop HPV infection from developing into cancer of the cervix. Countries in sub-Saharan Africa are therefore now experiencing a new crisis -- women are surviving a diagnosis of HIV infection because of treatment with ARVs, but are dying of cervical cancer. In Africa, cervical cancer has become the No. 1 cancer killer of women. More than 93,000 women develop cervical cancer each year on the continent, and an estimated 57,000 die from the disease. Because of the link between the two diseases, it stands to reason that an investment in HIV infection is an investment in cancer. The U.S. President's Emergency Plan for AIDS Relief (PEPFAR), originally introduced in 2003 by President George W. Bush, remains the largest commitment in history by any nation to combat a single disease. The initiative guaranteed $15 billion to be spent over the course of five years on prevention, treatment and research on HIV/AIDS. In 2008, President Obama reaffirmed the United States' commitment to an AIDS-free generation by signing a reauthorization of PEPFAR. 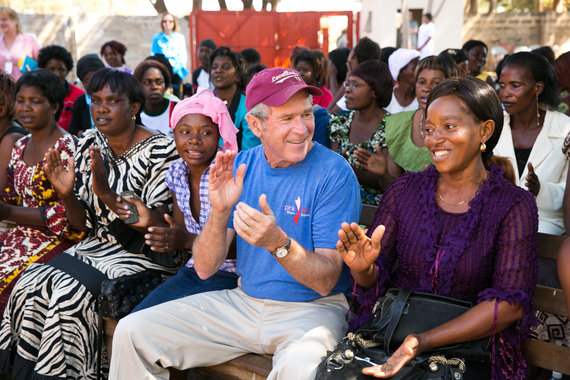 Today Pink Ribbon Red Ribbon, the global health partnership housed at the George W. Bush Institute, is building on the PEPFAR platform by adding cervical cancer screening and treatment programs to facilities that already screen for HIV. The HIV/AIDS Care and Treatment Centre at Bugando Medical Centre (BMC) in Mwanza, Tanzania, is one such place where women from around the region can receive both testing and treatment for HIV and screening and treatment for cervical cancer in a single visit, which gives them an opportunity to be saved from both diseases. The treatment they receive at BMC closes the gap between life and possible death. And it returns women to their community to have a positive impact on their societies. From an economic standpoint, investing in HIV and related diseases like cervical cancer continues to be a high-yield investment, with multiplier effects on productivity, efficiency and inclusive growth for Africa. These investments send a clear message that the economic participation of women is fundamental to Africa's future success. From an individual standpoint, it ensures the future generations, like those children living in Mwanza, Tanzania, spend their lives surrounded by mothers, aunts and sisters. After all, as President Bush reminds us, "It's not acceptable to save a woman's life from HIV/AIDS and watch her die from cervical cancer." Doyin Oluwole is executive director of Pink Ribbon Red Ribbon.